The Camping Recycled team are passionate about giving outdoor kit a second life. Whether it's a production sample, a display model or a refurbished item, they do everything they can to get tents, awnings, rucksacks and more, back into great condition and ready for adventures. 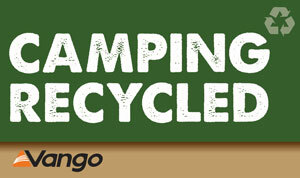 Camping Recycled are committed to minimising how much outdoor kit goes to waste. They refurbish tents and awnings and, if they are beyond repair, they strip off every component that can be used again, and use those parts to repair other tents and awnings. At the service centre, the highly experienced repairs team take great pride in repairing and extending the life of all products to the highest of standards. They then offer these items for sale through the Camping Recycled eBay store. The initiative funds the refurbishment of products and 1% of profits go to an outdoor based charity (to be announced imminently!). Camping Recycled has been trading on eBay since 2008; formerly going by the name Nearly New Tents. The range of available items grew beyond just tents to ex-display AirBeam tents, AirAwnings, footprints, cook kits and many other camping and outdoor accessories, so Camping Recycled was born! Most of the items on Camping Recycled are production samples, ex-display or refurbished. All products are thoroughly checked by the specialist repair team, before being listed on their site. The condition of the product will be clearly described in the listing. Camping Recycled pride themselves on great customer service and continue to support you after your purchase; all items come with a 1-year warranty. How do I find out more about Camping Recycled? Visit the Camping Recycled eBay Store and see what is currently for sale. Follow us on Facebook & Instagram to make sure you are the first to hear about new listings!